Yay, it’s dystopia time again! 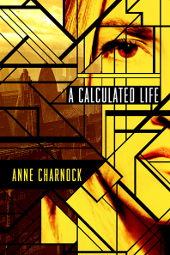 Science journalist Anne Charnock has decided to explore some of the questions arising from her work in literary form and the result is A Calculated Life. Far removed from the relentlessly bleak worldscapes of We, 1984 and their ilk, this story takes a much more detached, philosophical approach. Indeed the setting seems more window dressing for the ideas Charnock investigates, particularly the key problem of what it really means to be human. A Calculated Life takes place in a near future world, one familiar to fans of the dystopian genre. Overreaching governments and powerful corporations rule every aspect of our highly controlled lives. Society has become harshly delineated, with technologically augmented individuals occupying the few rungs at the top of the ladder while their unaltered counterparts are resigned to menial labour and life in the Enclaves, made-to-order ghettoes. Life in the Enclaves is rough, people constantly battling their situation and each other to remain afloat, constant conflict preventing them from ever challenging the social order. The action unfolds from the point of view of Jayna, a simulant. She represents a third societal strata, one altogether more unusual. Simulants are specially bred – or created – ‘humans’, grown from unique DNA mixes to express traits desirable to the employers who lease them. Jayna’s particular skillset involves extraordinary levels of pattern recognition, seeing through the noise of everyday life to uncover trends in everything from crime statistics and their relation to weather to the future of the hydrogen market. Simulants are designed for one purpose alone – work. From their separate living quarters to their suppressed sexual instincts, every effort is made to keep them seperate from their naturally bred counterparts. However a growing number of simulants are acting strangely, resulting in their recall to The Constructor. And it’s not long before Jayna begins noticing her interest in the little things around her, from the varied food being served at the simulant canteen to the inexplicable behaviour of the human children. This spark of curiosity awakens something in her, something forbidden in her kind. Something which surprised me about A Calculated Life was Charnock’s decision to relegate my favourite parts of dystopian fiction, the causes and consequences of societal upheaval, to the background. In fact even the origin and details of the simulants themselves is dealt with only superficially in snippets of conversation. Instead the novel focuses on Jayna’s awakening, her realisation that she is apart from the other members of what are nominally still her species. Her growing fascination with the chaotic natural world around her arises in a very believable way, never taking too abrupt or heavy-handed approach. It’s a journey of personal discovery, albeit one suffused in danger given her constant surveillance by employers and Constructor alike. Charnock has cited the works of Ray Kurzweil as a major influence in writing A Calculated Life, primarily the very real possibility that congnitively enhanced human beings may find themselves unable to communicate meaningfully with baseline humans. This is indeed the core of the novel. However from start to finish I found myself thinking more of Martin Eden, Jack London’s unsung classic about a self-educated working class man whose own attempts at bettering himself push him forever further from his fellows until the chasm is unbridgeable, leading to what was for me one of the most memorable and tragic climaxes in literary history. Here the story works almost in reverse, with the chasm being filled rock by rock until reconciliation is almost reached- although I’ll warn you not to expect a rosy ending. For a debut novel, A Calculated Life was a pleasing surprise. A slow starter for sure but one which soon gets the grey matter firing and leads to extended periods of quiet, book-in-lap contemplation, thanks largely to Charnock’s obvious enthusiasm for and familiarity with her subject matter. Such easily accessible yet intelligent fiction can be quite a rarity, and one to be savored.